25031 Desert Flower Ct Sun Lakes AZ is for sale in Sun Lakes Oakwood. Are you looking for a year round home or a get-a-way vacation home where you can spend the winter months? Consider homes for sale in Sun Lakes, AZ. 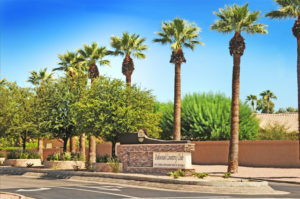 This active adult retirement community bordering Chandler in the East Valley of the Phoenix area is a top choice for retirement communities due to location, amenities and affordable homes. When considering homes for sale in Sun Lakes AZ, first consider what features are important to you. 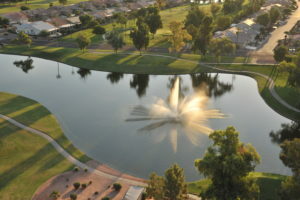 Sun Lakes offers five separate communities. You can choose gated or non-gated communities. Oakwood Country Club is the newest gated community and it is where our newest listing is located. 25031 Desert Flower Ct. is a two bedroom, two bath home with neutral tile everywhere except for the carpeted bedrooms. The laundry room has been extended to add space for a home office. Cooking and entertaining will be a breeze in this updated kitchen with granite counter tops and maple cabinets with slider drawers. The eat-in kitchen is perfect for casual meals and a separate dining room is great for guests and family dinners. This home features decorative paint that is warm and inviting. Walk in closet space is in both the master suite and the guest bedroom. Enjoy a master suite with dual sinks in the bathroom, a separate toilet room and spacious shower. Warm up to the outdoor fireplace on chilly Arizona winter evenings. Entertain with friends under the covered extended patio or just relax in the privacy of your backyard with block fencing. Don’t wait too long. This house is move in ready and waiting for you to call it home! When you buy 25031 Desert Flower Ct. you have access to three 9-hole golf courses, tennis and pickle ball courts, fitness center, restaurants and more. Take a walk around beautiful Diamond Lake on the walking path or stroll through the three mile walking path that winds through the neighborhood. Enjoy free entertainment in the Stone and Barrel Restaurant and Bar. Take in a concert or join a hiking or biking club. You will find something for everyone in Sun Lakes AZ. Are you ready to see 25031 Desert Flower Ct? Looking for homes for sale in Sun Lakes AZ? You just found us! 25031 Desert Flower Ct is for sale now! Call us at 480-440-0849 or contact us here.